Amber Valley opened their pre-season campaign with a comfortable win over Long Eaton. With limited preparation time immediately prior to the game it was good to see Valley get into their stride early on in this encounter. The game was played in 20 minute quarters to enable both sides to tinker with positions, tactics and to allow the entire squad to get a run-out. Valley started brightly with the forwards getting into the game with a good scrimmaging display and some good running rugby orchestrated by Timmy Willan and some good breaks by the back line. Lee Steemson showed he has recovered from a broken ankle with some typical string runs that later in the game culminated in two tries, one from a set move bursting through the middle and another out wide. Karl Bunting took the first score of the evening however from short range followed quickly by another by Dave Gartside. The second period saw Valley’s and Long Eaton’s squad players come into the fray but there was little disturbance in the type of play played by either side, a testament to the strength in depth Valley are building. Now playing under floodlights, the team brought back on the established players who ripped through the Long Eaton defence, Steemson grabbing his second try and winger Stu Jones using his blistering pace to leave the Long Eaton defence for dead as he powered down the wing before touching down under the posts. 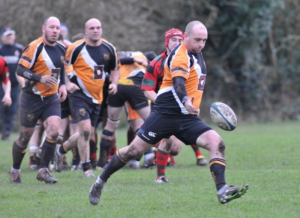 Rob Robbins showed that age hasn’t dulled his skills as he broke through a despairing tackle on his way to another score. The game was finished off nicely with new player Karl catching a poor clearance from the Long Eaton full-back and seeing wide open spaces in front to score his first ever try for the club. This Saturday sees a further pre-season test at home against Mansfield 2nd XV. The 2nd XV start their Pennant League campaign with a home fixture against Melbourne 2nds. Both games kick-off at 3pm. The club should be encouraged by the display from some of the clubs newer players, putting pressure on first XV players and hopefully driving up standards of play throughout the club. With Valley trying to build on the success of last season and once again push for promotion to Midlands 3 it is vital that the strength in depth is there. If any players who have drifted away from the club or any players who fancy trying their hand at a new sport training continues on Wednesdays at 7pm.